Aspden spent much of 1980 in the United States, including a residency at the Australia Council’s Greene Street Studio in New York. 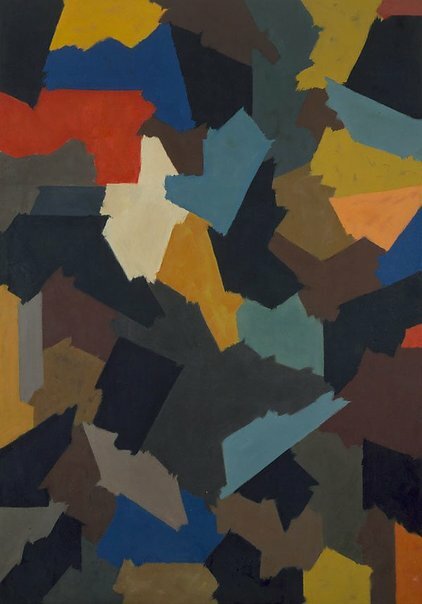 The year, with its new and diverse visual and intellectual stimuli, was a regenerative experience and resulted in a marked change in Aspden’s work, with the compression of forms into the foreground of the canvas, a darkening of his palette and a return to oil paint after many years of favouring acrylic. The dense urban environment of Manhattan, and especially the rooftops of buildings, was a direct stimulus for this painting and the related Ali’s bar (New York). Signed and dated u.r. verso, red (oil?) "... ASPDEN 80". Deborah Edwards, Australian art: in the Art Gallery of New South Wales , 'Mosaic and figure', pg. 213-214, Sydney, 2000, 237 (colour illus. ), 300. Jeffrey Makin., Sun , 'Outback at its best', Sydney, 18 Mar 1981. John McDonald, The Sydney Morning Herald , 'Harmonious effects', pg. 14-15, Sydney, 13 Aug 2011-14 Aug 2011, 14 (colour illus. ), 15. Article appears in 'Spectrum' supplement. Anne Ryan, David Aspden: the colour of music and place , 'David Aspden: the colour of music and place', pg. 6-11, Sydney, 2011, 9, 10, 50 (caption), 51 (colour illus. ), 82, 88.